Charles Darwin University and the Chief Minister marked today’s 40th anniversary of the Aboriginal question referendum, by securing the future of the Vincent Lingiari Memorial Lectures. CDU’s Vice Chancellor, Professor Helen Garnett welcomed a commitment by the Chief Minister to provide $10,000 a year in funding to secure the future of the lectures. The annual Vincent Lingiari Memorial Lecture commemorates the walk-off, led by Vincent Lingiari with his Gurindji people and other groups from Wave Hill Station in August 1966. This was a significant act by those involved as it was a catalyst for Aboriginal people, not only in the Northern Territory but across Australia to have their rights to traditional lands recognised and for those lands to be returned. CDU’s Vice-Chancellor Helen Garnett said she supports this commemoration and said it was important that historic days, such as the 40th anniversary of the referendum and 41 years since Lingiari and the Gurindji people walked off Wave Hill, did not pass with out recognition. In accepting this year’s contribution Professor Garnett said she was looking forward to this year’s lecture and thanked the Chief Minister for the Territory Government’s support in ensuring the future of such an important event. 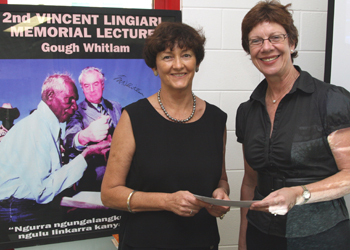 The Vincient Lingiari Memorial Lectures have been run annually since 1996 and have included presentations from prominent Australians including Gough Whitlam, Sir William Deane, former Prime Minister Malcolm Fraser and Patrick Dodson. The School of Australian Indigenous Knowledge Systems at CDU will be co-ordinating this year’s Vincent Lingiari Memorial Lecture and the Chief Minister’s support will ensure the commemoration of this important moment in Australian history continues for this and future years.